Catherine Cavendish: Miss Abigail's Room Revealed! 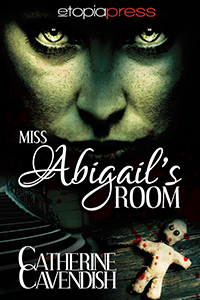 Miss Abigail's Room will be published by Etopia Press in all digital (ebook) formats in the next few weeks. Scary, creepy and resonating with Gothic atmosphere, I can promise this is not a story to read on your own at night. Especially not if you live in a house with creaky floorboards...doors whose hinges need oiling...or anywhere near a doll. You've been a busy one haven't you :) It looks great!